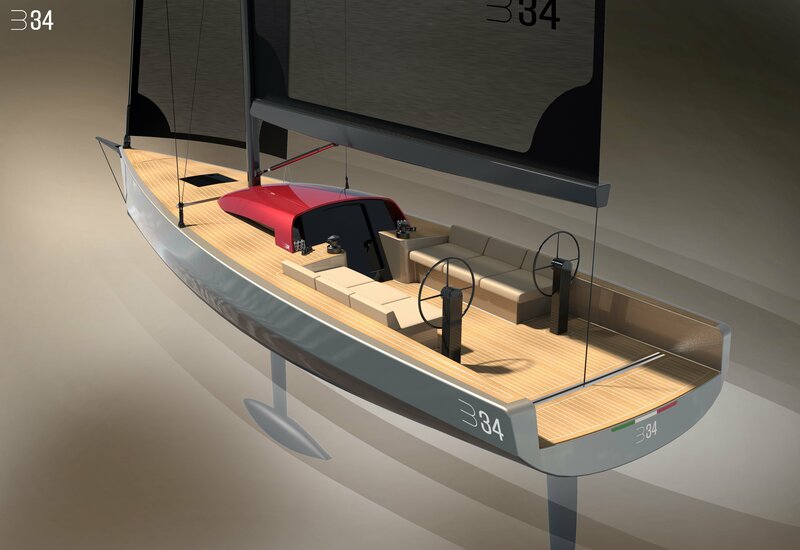 The new B34 project is the first of the new generation of daysailer boats designed by Luca Brenta, for the pure essence of sailing. At LBY we say “the best comes out of dreams that you have deep inside”. 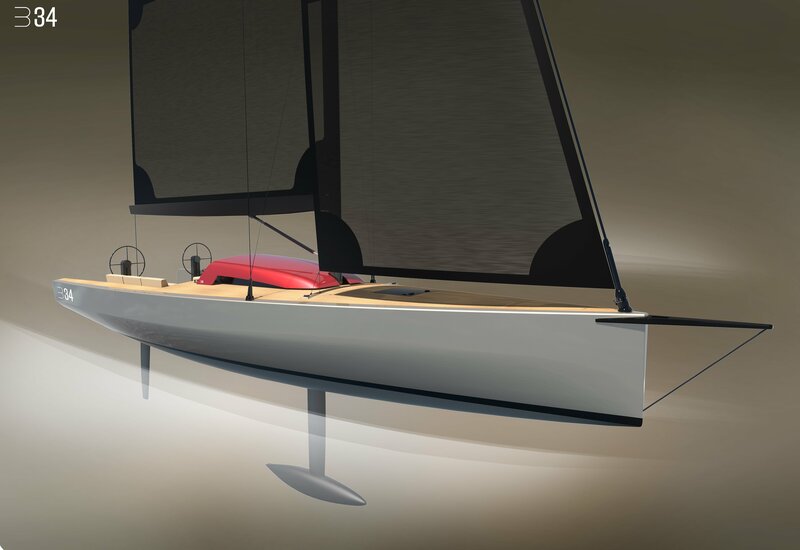 The mission and concept behind the project, is to conceive a monohull boat of 10 mt., a very fast boat on the water in real time, no rating tricks that compromise water lines, elegant sleek look, a yacht simple to handle also single handed or double handed. No need for crew, if owners want a daysailing tour on his own. Water lines take inspiration to the bigger custom boats designed by Luca Brenta in the last years, with their distinct elegant look. You will be able to tell is a Brenta boat from distance. The construction will take advantage of the most advanced technologies, with infused hybrid carbon fabric coupled to 100% carbon structure and reinforcement, with epoxy resins post cured. A must for a light and stiff boat. The T keel will be made in weldox steel, paired with a lead T bulb. An optional high modulus carbon mast and boom is available , coupled to rod rigging and many standard high teach, latest generation racing accessories complete the performance and look of deck layout. The upwind sail surface is around 68 sqm, while reaching with a top mast head gennaker will top up at 180 sqm. thanks also to the integrated elegant 1 mt. bowsprit. Fractional halyard for heavier wind gennaker also available. Also on the cruising side many options are available, as a removable cockpit table, a bimini over cockpit, spray hood, hot shower in cockpit, removable swimming ladder. B34 is a daysailer with weekender capability for the more sportive sailors. 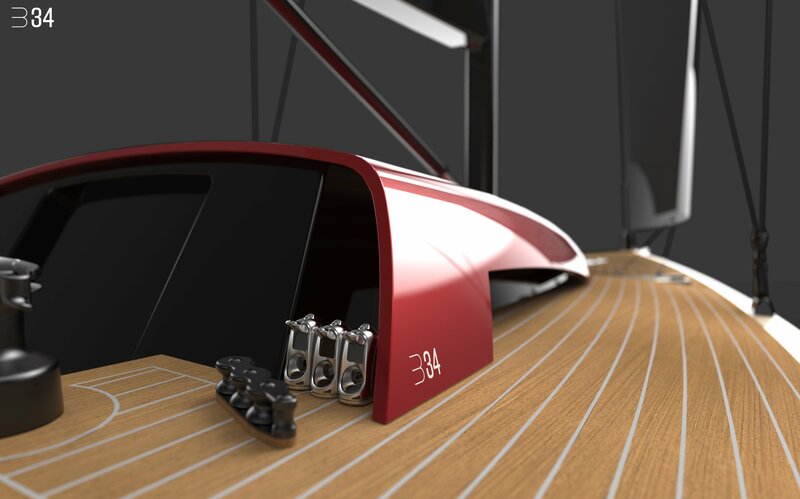 The light and technological advanced construction , with a minimal and light interior, sleek and fast water lines, meets the concept of a pure racing cruising boat , therefore we see that the B34 will also can be read as a “Luxury Racer”. The B34 has an very generous cockpit that can accommodate 6 people, sitting on the two lateral benches, standard electric winches for trimming halyards and sail sheet available. The jib feature a self tacking track , while the integrated hull bowsprit allows simple lunching of a Code Zero or Gennaker, when the wind angle widens reaching. The interiors will reflect the minimalistic and elegant look approach of Luca Brenta. Starting on the bow we find a twin bed, then coming aft in the mast area we have a garment locker on the left side and wc toilet hidden in a bench furniture with over hanging locker. Coming aft in the central section we find two sofa/beds with two half size forniture on each side that host a fridge and optional cooking stove and sink on the other side.